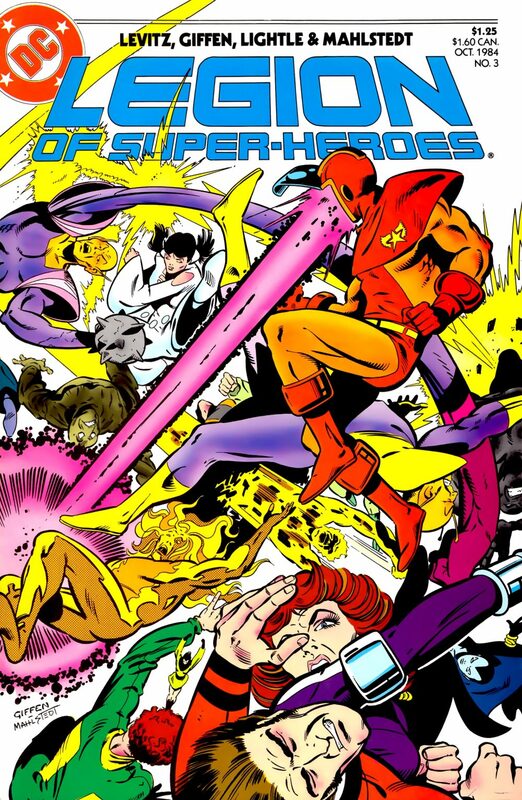 The chronological storytelling of the Legion of Super-Villains story hit a bump with the publication of the Legion 1984 Annual. We are able to pick back up the story with the third issue of the Legion Baxter series. This issue looks to be real exciting, too. We’ve got the Legion fighting the new Legion of Super-Villains on the cover. It can hardly contain the action, with it spilling off of every edge. It’s a great Keith Giffen cover, even with his new style of artwork. We notice something when we look at the names at the top of the cover, though. There’s a new name there, Lightle. Opening to the front page we see the penciller is Steve Lightle, and Keith Giffen is credited with “designer.” What’s going on here? The Legionnaires leave the Sorcerers’ World, talking about the threat and unknown motives of the new Legion of Super-Villains. Terrus and Zymyr warp away all of the travelling Legionnaires except Dawnstar fly directly into the portal that suddenly opens in front of them. On Earth, Element Lad leaves with most of the remaining Legionnaires for Orando, the source of Karate Kid’s alert signal. He leaves behind Cosmic Boy and his girlfriend, Science Police officer Shvaughn Erin. He promises Shvaughn when he returns, they’re going to have a long overdue talk. Cosmic Boy receives a call from Night Girl offering help from the Legion of Substitute Heroes. On Orando, Light Lass awakens to find herself, Karate Kid and Projectra prisoners. Her brother Lightning Lord visits her and offers her a place with the Super-Villains, where she too can go to “the new universe” they are planning to conquer. When she refuses, he attacks her with lightning until she falls unconscious. He leaves, proclaiming that she is no longer his sister. Meanwhile, Dream Girl wakes up in her crashed Legion cruiser only to attacked by Hunter and Silver Slasher. On Earth, R.J. Brande meets with Earth President Marte Allon who has announced her imminent departure as President of Earth. In space over Orando, the two legions battle, just as Element Lad’s team arrives to reinforce the super-heroes. Nemesis Kid prepares machinery to take the super-villains to a universe where they can conquer without interference from the Legion of Super-Heroes. Just as the Legion is gaining the upper hand against the super-villains, Zymyr warps away the villains and a handful of Legionnaires, too. As the remaining Legion members recoil from the retreat, Orando vanishes completely. Nemesis Kid boasts that he is the only leaders the legion of Super-Villains will ever have. 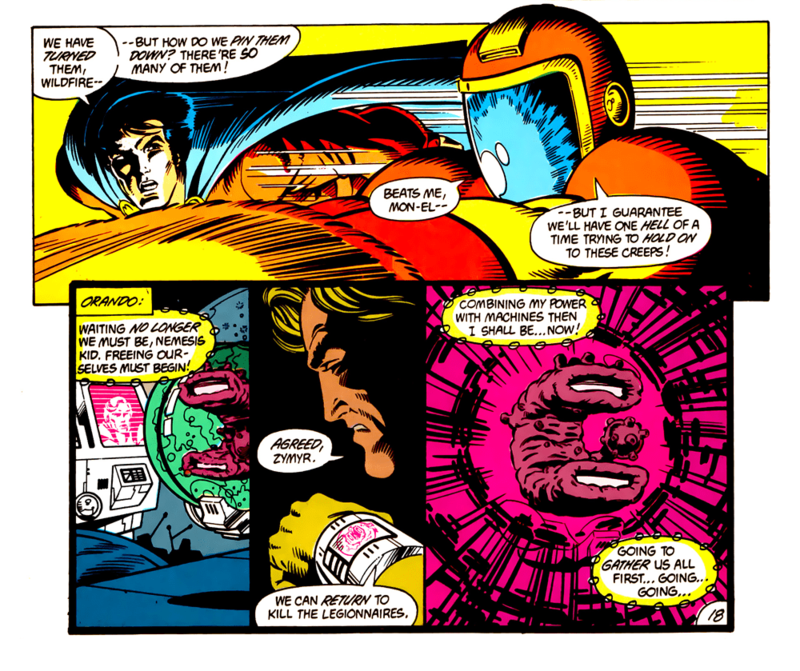 The story progresses from the previous issue, but without reading the Annual, it’s a little confusing at the beginning. Paul Levitz does an admirable job of keeping the events flowing linearly. In doing so, the travel time from Legion HQ and Orando is extremely quick. This pacing also gives us no reasoning that Dream Girl got off Orando, but she’s there, watching as the planet vanishes. It’s a trap that many Legion stories has, keeping up with two dozen characters. What I like in the writing is the way the Legion is fighting to get ahead of the Legion of Super-Villains. By the time Orando vanishes, everything they think was known about their motives is thrown out of the proverbial window. It’s also nice to see the traditional powerhouses among the Legionnaires given so much trouble. Too many times in the Legion’s history Mon-El, Ultra Boy, Wildfire and/or Superboy seem able to stop the threat too easily to make a story compelling. The first three are stopped by heroes of vastly different power levels than them, including Sun Emperor and Magno Lad. It’s nice to see the Legion’s teamwork turn the tide of a battle. Steve Lightle’s artwork is a departure from what we grew used to. It does look like he worked from Keith Giffen’s layouts, as many panels are laid out in the style he had grown accustomed to using. This is very early in Lightle’s career. The fluidity his work now has isn’t here, but the core of his style is apparent. He keeps the characters individual, and his use of shadows accurately reflect the environment. He remains one of my favorite Legion artists. If you’re looking for the issue itself, then you should be able to find it with a little searching. Don’t pay more than a few dollars for it, as you can probably find a copy in bargain boxes. This issue has been collected in Legion of Super-Heroes: An Eye for an Eye (ISBN: 1401215696) Look for it, as this story is on par with The Great Darkness Saga (ISBN: 1401244165), which could also be read just to give a little reasoning behind Ol-Vir’s apparent insanity. I like it better than the previous issue, but some of the flaws in plotting keep me from rating it much higher than that one.